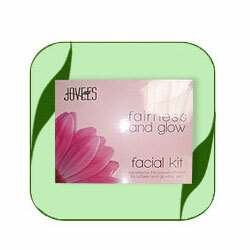 Jovees Fairness and Glow facial kit contains six products. The products for the facial should be used in order as explained below. The amount of melanin, the skins pigmenting agents in the body determines the colour of the skin. Each product has been developed using ingredients derived from natural source and processed scientifically that help maintain the therapeutic properties of the herbs thus ensuring optimum results. A natural gentle facial cleanser that contains precious botanicals and herbal extracts that helps lift away impurities and dull surface cells to improve over all skin clarity. It deep cleanses the skin, keep complexion even toned and achieve a clear matt-look skin. Massage into the skin for two to three minutes and wash thoroughly with plain water or remove with wet cotton swabs. Lemon extract, Rosemary essential oil, Sunflower oil, Blackberry, Coconut and Almond Oil. Moisten face. Apply all over the face and neck. Massage gently with fingertips for 2 to 3 minutes in circular motion. Wash with plain water or remove with moist cotton swab. Apricot Kernel Oil, Almond Oil, Wheatgerm Oil, Walnut Shell Powder. It contains precious herbs along with Vitamin-E that restores a smooth radiance & collagen elasticity to the skin. It helps in cell renewal process and improves skin's firmness, leaving skin radiant & luminous. Moisten face. Apply Face Massage cream on face and neck. Gently massage for 15-20 minutes using upward & outward strokes. Remove with moist cotton or rinse thoroughly with water. A unique natural formulation developed for all skin types. This natural gel based skin toner cleanses and closes up pores, tones the skin, tightens tissue to leave skin clean and clear. Apply a small quantity all over face and neck. Gently massage for 2 to 3 minutes and wipe off with moist cotton swab or wash with plain water. Witch Hazel, Basil, Aloevera, Cucumber extract, Honey. An exclusive pack that helps to reduce the production of melanin, improve skin texture and brings glow to the skin. Apply a thick layer on face and neck. Leave on for 20 minutes. Rinse thoroughly with plain water. Bearberry extracts, Liquorice extracts, Arbutin, Multani Mitti. A natural whitening formula containing skin lighteners derived from natural sources that help in reducing the production of melanin, provides deep down moisturising, clarifies the skin, brings glow to it. It shall also protect skin from UVA and UVB rays. Apply a small quantity all over face and neck and leave on. Saffron extract, Bearberry extract, Nigra root extract, Saxifera extract.